Der Artikel Johann Sebastian Bach (1685-1750): Cembalokonzerte Vol.3 wurde in den Warenkorb gelegt. One absolute highlight this month on our complete recording of Bach's harpsichord concertos with Lars Ulrik Mortensen is the performance of the concertos for two, three, and four harpsichords featuring the prominent guest Trevor Pinnock. 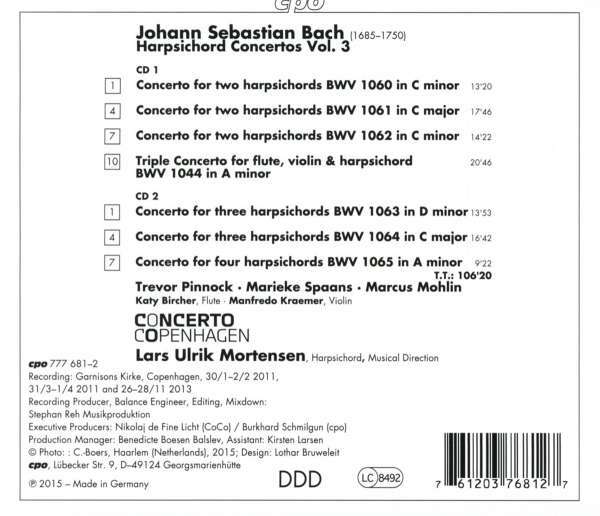 While Bach presumably composed his seven concertos for one harpsichord and strings for himself (previously released as 8472071 and 3916544), he most probably intended his six concertos for two, three, and four harpsichords for his sons and pupils. The Triple Concerto in A minor for Harpsichord, Flute, Violin, and Strings is filled to overflowing with rhythmic and harmonic contrasts and recalls the Brandenburg Concerto No. 5, with which it clearly shares a prominent harpsichord role. The top-class Concerto Copenhagen ensemble from Denmark, popularly known as »CoCo« and now ranking as one of the world's best orchestras performing on original instruments, once again presents a most highly spirited interpretation of Bach's virtuoso concertos under and with their conductor Lars Ulrik Mortensen. Mortensen once again proves to be a harpsichordist and conductor with a flawless sense of style. 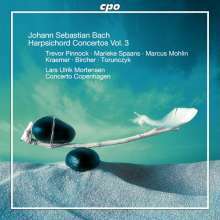 The reviews and reactions to the previously released harpsichord concertos speak for themselves: »It is not a secret to those in the know that L. U. M. is an excellent harpsichordist who combines fabulous technique and profound knowledge with uncommonly fine musicality. Just listen to how intelligently and elegantly he articulates long sixteenth chains, how supple his musical gestures are, and how imaginatively and unvainly he renders the embellishments. His interpretation is always delightful, and the same applies to the Concerto Copenhagen. The Danes play with a warm tone and soft articulation without detracting from the clarity« (klassik-heute. com 10 / 03).